The photo sharing service is cutting back on your storage options and it isn't doing it nicely. 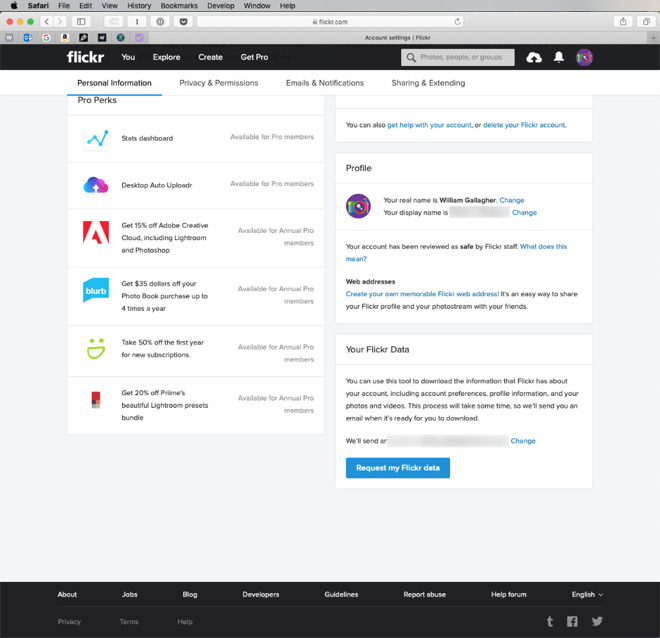 AppleInsider shows you how to get your images out of Flickr before the company starts removing them. 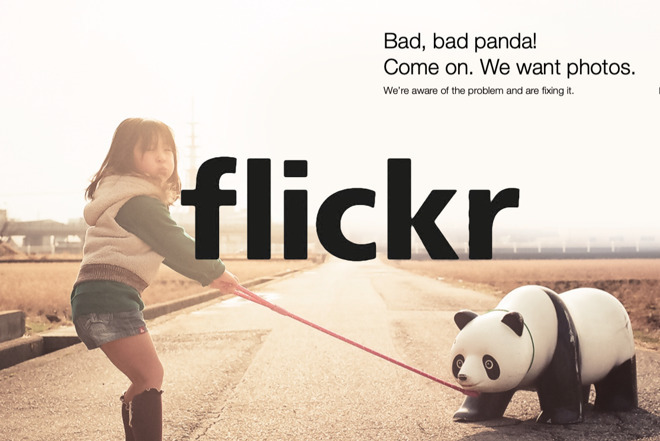 Editor's note: While this tip was first published in November, Flickr will start deleting user photos on February 5. If you haven't done so, and are on the free 1000-photo limit plan, and have more than that stored, now's the time to download your photos from the service. You can't blame a company for having to make changes and especially not when it's been giving everyone a terabyte of free storage. You can, though, blame Flickr for how it's managing this change. If you're the sort to leave things to the last minute, good luck working out when that is. It's most likely to be January 8, 2019, which is officially when all free accounts will be limited to 1,000 photos and videos. If you are over that limit at that date, though, all you'll see at first is that you can no longer upload any more. Then starting from February 5, 2019, your images and videos will start to be deleted. There's no clue how long that will take. Flickr just says the deletion will begin "from oldest to newest date uploaded" until you're down to the 1,000 limit. The company does also say that users who are currently over this new 1,000-limit tend to be ones who are solely storing instead of sharing images. "The free terabyte largely attracted members who were drawn by the free storage, not by engagement with other lovers of photography," said Flickr Vice President of Product, Andrew Stadlen in an announcement. "This caused a significant tonal shift in our platform, away from the community interaction and exploration of shared interests that makes Flickr the best shared home for photographers in the world." If you're into Flickr for work or professional use, if you just have a lot of images on the service, either get them off now -- or pay a subscription. For $49.99 per year, Flickr Pro not only lets you exceed the new 1,000 image limit, it also lets you go over the old 1TB one as well. It promises unlimited storage of full resolution images. There's also more access to statistics about the use and re-use of your images, plus the company stops displaying adverts to you. You'll get various other benefits from being a Pro user, such as increased lengths for your videos, from some time next year. The company is currently offering a 30 percent discount if you upgrade to Flickr Pro before the end of this month. Note that while you can always cancel your pro account, you won't get refunds and your service will continue to the next renewal date. Whether this is all worth the cost is up to you but we suggest that even if you're happy to pay for Flickr Pro, get a copy of your images off the system now. The one thing we won't miss about Flickr is that it's always felt a bit amateurish and stuck in a Yahoo past. One of the changes coming to the service alongside this new limit is officially that you will no longer be required to use a Yahoo Mail account for your login. The company says this has been a regular request from users and that they expect it to be popular when they introduce us. 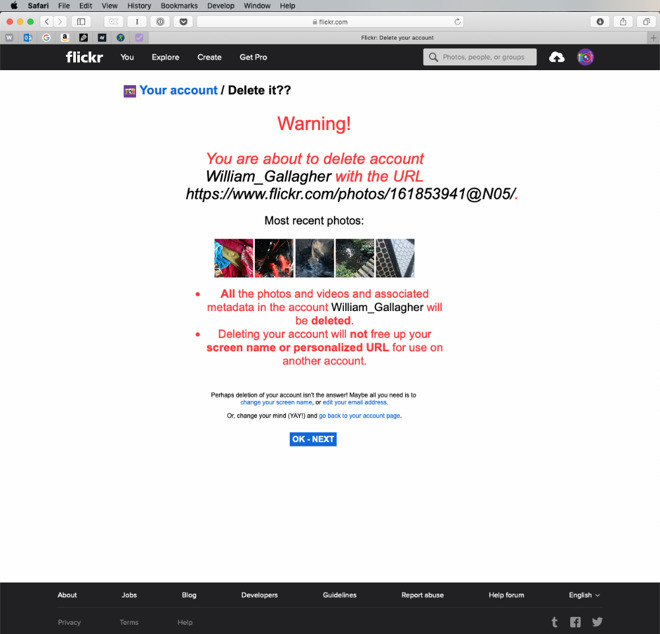 We just tried creating a new Flickr account and it accepted an iCloud address without problem so we're not sure what the fuss is. Yet this does fit the kind of schizophrenic nature of Flickr where you bounce between modern, even beautiful website design and into pages that look like they were made in the 1980s. You'd hope a company devoted to images would have a better-looking design but then design is about much more than how something looks. It's also about how it works and here Flickr is tedious. Most of the time when you want to do something that affects all of your images, you log in to the service and click on the You button. Except when you don't. Other times, you need to click instead into your account settings. These are held under an icon at the opposite side of the menu bar from You and under an icon that's your profile picture if you've set that up. Or a purple image of a camera if you haven't. Click on it, then from the dropdown menu click Settings. On the page that appears, scroll to the bottom and on the right hand side of the screen you'll see a section called Your Flickr Data. There's a button marked Request My Flickr Data. Choose that. Flickr doesn't give you the option to download your images right there and then. Instead it collates them all into a single zip file and emails you a link to download that. It's not quick. In our new test Flickr account, we uploaded 10 images and then requested all our data. It took Flickr 12 minutes to send us the email link. There's no way to extrapolate from that how long 1TB of images would take but don't leave this until midnight on January 7. You do get all of your images. Only, it's not pretty. This is how our ten appeared when we downloaded them. Forget the unintelligible folder name, we're just going to move the images out to storage somewhere else. Yet as well as that, every single photo has its original name with a Flickr reference number appended. Maybe this is useful if you want to check where your images have been used. Maybe it'll help you track down every site that used to link to you on Flickr and now you have provide an alternative to. These are your photos, though, they're not Flickr's and if it's down to either you or Flickr removing this extraneous filename data, we'd vote for them to do it. As they haven't, take a look at A Better Finder Rename 10 which is an app that will help you when you've got to change the filename on 1TB's worth of files. Get the app and use these settings in the Character Positions & Ranges section. If you're a photographer with, say, an old MacBook Air then there is the strong chance that you won't have enough storage space on your machine to download all of your images in one go. In that case, you're going to have to do it album by album. Or if you haven't sorted your Flickr images into albums, then shot by shot. 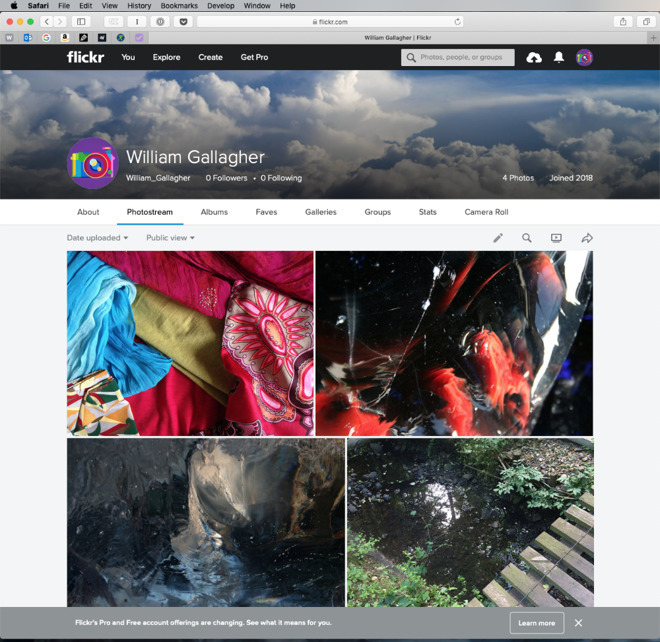 Log in to your Flickr account and this time do click on the You section. From the dropdown that appears, choose Camera Roll. Then go through ticking to select what you want to download now. When you're ready, look for the download button at the foot of the screen. You will have to scroll and it may be covered up by Flickr's warning banner about these new changes, but it's there. Click Download, then click on Create zip file. Again, Flickr won't let you do anything right there and then, it has to collate the photos first. When it's done, the service will email you a download link. Now you've got all these images, you do rather need to keep them somewhere. The answer depends on what you want to do with the images. If you are solely storing them as an archive, look at online backup services -- but note that the first time you join one of these, it is going to take weeks to upload all these images. To keep the images somewhere that you can easily share them to other people, your choices are more complicated. Adobe Creative Cloud can give you up to 1TB storage for your images and it's a good service for sharing some or many photos. However, it costs about $120 per year for that and while you get Adobe Lightroom thrown in, it's over twice what Flickr Pro costs. Then there is Dropbox which has 1TB for $99 per year and sharing images to people is reasonably straightforward if not as easy as it is on Flickr. Similarly, Microsoft OneDrive can get you 1TB storage for $70 per year and that comes with the entire Microsoft Office suite. There is also Google, though, which for the moment is complicated. Google is currently rolling out Google One, a service that might be just what you need for storying large volumes of images. However, it's not available everywhere yet. You can sign up to be notified when you will be able to use it. And ultimately it will offer more than its rivals: for somewhere around $1,000 per year you'll be able to store up to 10TB. Or at least until Google decides to make this the latest service it closes. Flickr's move doesn't seem unfair or unreasonable. We would, though, have preferred more than a few weeks' notice. We'd also have liked a less clunky way of saving our own images out of the service. Yet if it needs fiddling with and if it needs some patience, still at least you can get your images back and you do have options for where to save them next. Its been a long time since I used any of these photo sharing and storage sites but when I did, the one thing that pissed me off was the fact you could not retrieve your full resolution image. If you selected to download the image it would give you a compressed version of the image. If you wanted the original you had to be a paying member. They basically held your original photo's hostage unless you paid them. I had friends who use to download all their photos from their digital camera directly to Flicker and such and did not realize they could not recover their original without paying. I maintain all my photos and media on multiply backup drives, and I have NAS with 8TB so all my digital content is mine and I do not have to pay someone else to keep it for me. That is why I prefer to keep storing on my cloud server and run my own backups. Terrabyte is nothing and one can have personal 10 TB servers easily. It looks like storage services like this are not mature and it was simply a gimmick to get public attention into sharing entertainment. thse days you can do it easily iusing your own storage. Now argument of backup is gone... since Flickr will be deleting and limiting randomly. I also do not understand why I need to pay for something I pushed to the service to get my original version - that sounds like extortion stand point. I get full quality pictures from owned server. Same with music and videos. It seems that need outgrows those commercial services capability. Flickr is mostly dead now. Used to be the place where creative photographers would connect and support each other but everything has moved to Instagram and Flickr has tried in the past to save itself from extinction. I think this charging service will finally kill Flickr. Nobody uses it so much anymore. Where to put it? The parent company’s SmugMug system of course! As a long time SMger, I really want you to help pay for the acquisition because I got toasted at my last yearly membership fee. It’s business plan and simple. This is yet another reason why keeping yourself in the CLOUD is a bad idea!!! You can as one of your backup solutions. But don't rely on it only. If all your pictures are at your house, and you get robbed and they take them, or worse, your house burns down to the ground, or you have a flood, or a some other natural disaster, you want your pictures at a number of sources. Google is free, but they do lower the resolution some. If you're a Prime Member, you can send your pictures to Amazon using their photo App. These solutions require the app running so that it'll backup your pictures. If you use Apple's Storage, it'll be automatic. So send your pictures a few different places offsite. I also use Carbonite on my Windows computer to backup specific directory's. Since all my phones on my iPhone and iPad get transferred to my Windows computer automatically using Apple's iCloud app on my computer, that picture directory gets auto backed up to Carbonite. That is all Encrypted. So no one see's any of that Data. It doesn't get compressed, or screwed around with. It's saved me a number of times over the years. I also dump my pictures to my NAS. Which I have over 13TB of storage on it. It's ALMOST FULL, under 1TB now. I'm going to have to upgrade my HDD to larger ones. The only practical way to backup a NAS is with another NAS. My main NAS is a expensive commerial type NAS, but my other NAS is a much cheaper, low cost HOME NAS. It powers up a couple times a week late at night, so my main NAS can rsync to it. In the morning it's powered down once again. If you value your data, in this case pictures, and don't want to risk losing them, as I had in the past on some, you want a number of backups. At minimum 2!!! Sounds like Flickr is about to crash and burn, and this poorly conceived strategy to grab some cash is proof. I’d also be more inclined to start deleting the latest pictures first, rather than starting with the older ones. Folk are more likely to spot newer pictures vanishing first, and the older ones are less likely to have copies, and will be arguably more valuable. Oh, and for the folk demanding that Apple gives them free terabytes of free storage – this is why the don’t. Well to be fair, photographers showcasing their work, and many have on Flickr over the years, would not get too many folks seeing their work stored on their local storage devices. You are only looking at this as a backup, it wasn't for many. This is probably a smart move as it is very cheap at $50 a year for those using it as intended. Which commercial-type NAS do you use now? I'm in the market for one and soliciting information from individuals who have actual experience. TIA. Meh. I’ve been over Flickr for many years now. It was a great artist community until they started driving artists away in favor of snapshot sharing. I was one of many artists who got into conflicts with Flickr staff because staff didn’t like our content, despite it being reviewed as safe and as following the rules. Certain staff, even went so far as to declare that they didn’t want to see certain types of content on their “sharing service”. I could name names, but I presume that would go against AI TOS. I wasn’t the only artist driven away in anger, after being bullied by Flickr staff and a minority of fellow users taking advantage of the bad attitudes of staff to harass fellow users with whom they had personal issues. There were even some publicized cases of abuse of artists in the online media, but it ultimately went nowhere because Flickr was a commercial service, and a privately owned space, not a publicly owned space to engage in free expression. I keep an account open to occasionally keep in touch with former community members. The community, and the value of the tool itself, died years ago, as far as I’m concerned. Flickr staff got exactly what their actions promoted: a storage place for people’s snapshots. Now they’re trying to cut off the very last purpose they left for it. Whatever. Eventually Flickr will be no more. As I said: meh; I’m long past caring about it. If you already have an Amazon Prime membership, it includes unlimited full resolution photo storage.... and 5 GB total for other files/video. Extra tiers of storage for 'other files' do cost more than the basic prime membership. They do allow creation of albums, sharing albums, etc... it's not same feature set as Flickr, but as an offsite backup of a lot of photos, it's a good option to consider. They have a Mac and Windows desktop app, as well as IOS and Android apps. Amazon drive app adds the option of integrating with IOS Files app. This article is missing some key context: SmugMug acquired Flickr in April 2018. The changes to # of photos and pricing is pretty much exactly what people should have expected after that deal. Why would SmugMug acquire Flickr and maintain an entirely different pricing approach vs their own? Everyone commenting about what this means for Flickr's health clearly is unaware of the acquisition several months ago that prompted these changes. It is just beginning. Next step will be $50 for 5000 photos and so on. They are already deleting content now. More and more of my Favorite photos are disappearing every day and I have been a registered user since 2008. Just like what happened to Webshots in 2013, R.I.P Flickr. Guess I will be officially onboard the Instagram wagon this year. Right, as it's after January 8. I did not upgrade to Flickr Pro - I would have considered it if they stored the Apple Live photos, but they don't... just the static image. Amazon photos stores the Live photo without resolution loss or gimmicks like gifs. I also have OneDrive 1 TB option, but haven't turned on their equivalent to optimize storage - IE, free up space on the Mac when the item is uploaded. Heh! Good thing I've opted for the 2TB iCloud Storage option. I manually upload my photos there and index them. Cumbersome, but well worth the effort. iCloud Photo Library is a little risky, considering how easily a photo can be deleted. I wouldn't use any third party storage.